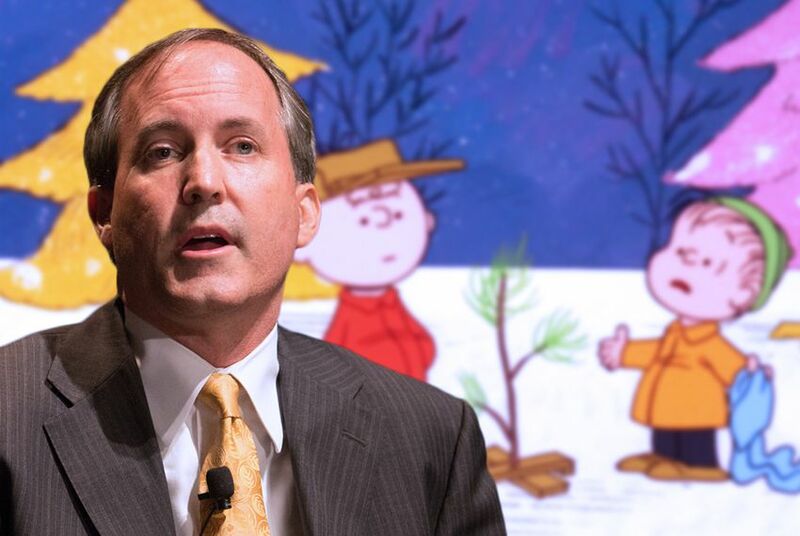 Ken Paxton has come to the defense of a Christmas-themed Peanuts poster at a Texas public school. This isn't the first time elected officials have fought over Christmas; in fact, it's something of a holiday tradition. When a principal at a Killeen middle school ordered a staffer to remove a Christmas-themed cartoon poster last week, Texas Attorney General Ken Paxton quickly came to the poster's defense. He said the decision to take down the Peanuts-themed image, which quoted Linus from "A Charlie Brown Christmas," was an "attack on religious liberty." Greg Abbott — then the attorney general — went to bat for Christmas in 2011 in Athens, Texas, where a Wisconsin-based atheist group was working to remove a nativity scene outside of the Henderson County Courthouse. "Our office has a history of defending religious displays in this state," Abbott told a local Fox News affiliate. "Our message to the atheists is, 'Don't mess with Texas and our nativity scenes or the Ten Commandments.'" It was Christmas in June. After the 83rd Legislative Session in 2013, then-Gov. Rick Perry signed legislation nicknamed "The Merry Christmas Bill" clarifying that school districts were allowed to put up decorations such as nativity scenes and Christmas trees on school property. Most importantly: Teachers and students were allowed to say, "Merry Christmas." At the bill's signing, Perry said, "Religious freedom does not mean freedom from religion." Shortly before Thanksgiving in 2013, an email from the Frisco ISD PTA issued "Winter Party Rules" that banned Christmas trees, references to Christmas or other religious holidays, the colors red or green, and food or drink that could stain the carpet. State Rep. Pat Fallon, R-Frisco, reached out to the school district to point out that the "Merry Christmas Bill" allowed all of those things (minus the carpet stains). “Please note that such restrictions are unnecessary, inappropriate, and quite frankly draconian in nature,” Fallon wrote. In December 2014, the Texas Nativity Scene Project unveiled a nativity scene at the Texas Capitol to combat the "War on Christmas." The scene was made by a private group but supported by both the State Preservation Board and Abbott's office. In December 2015, Abbott and Paxton went to bat for Orange County, where officials had removed a nativity scene after a local atheist group requested permission to display a “Happy Holidays” sign next to it. Abbott and Paxton urged them to consider putting it back up. “I strongly encourage the city of Orange to stand up to the demands of a select few who wish to see God thrown out of the public square, embrace the season of Christmas and restore the Nativity Scene immediately,” Abbott said in a statement at the time. Just three days before Christmas in 2015, Abbott asked the State Preservation Board to remove a "winter solstice" display from the Texas Capitol. The display, put on by the Freedom From Religion Foundation, urged the separation of church and state. Abbott called it a "juvenile parody." It was taken down.